Highest Quality Punch Tool with industry standard Twist-to-Release 66 Blade. Heavy Duty Punch Tool has High/Low Impact Selector, and a Cavity in the Top to store a 66 or 110 Blade (only the 66 Blade is Included with this Part Number). 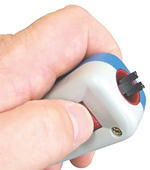 A Spare Blade locks into the Cavity in the tool, and releases easily with a twist of the Release Knob.